These explosion proof enclosures - High Pressure Housings - are UL & cUL or ATEX-IECEx approved for use in hazardous locations with Temposonics position sensors. The ATEX, UL and cUL approvals cover flammable gases, vapors and liquids and the ATEX-IECEx also covers dust. 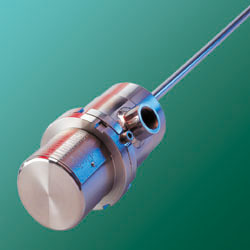 These housings are made to fit Temposonics G-series sensors with analog and start/stop outputs, R-series sensors with analog and digital outputs, the L-series Start/Stop sensors as well as the S-series ServoSensor. Both integral cable and connector versions can be used. When using a standard sensor in this housing you get a cost efficient solution for use in hazardous locations which also allows easy sensor replacement. 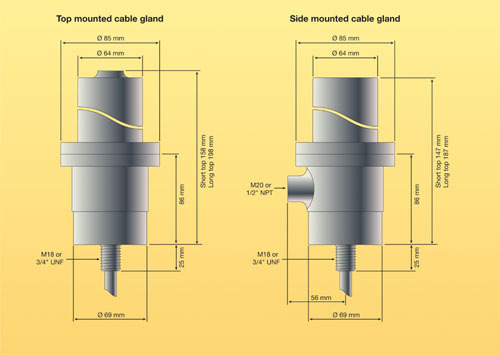 M18 or 3/4"UNF Mounting flange thread - M20 or ½"NPT opening thread - long or short top - top-mounted, side-mounted, or dual side-mounted openings. See Combination Chart in the downloadable pdf-datasheet. All parts are made from 316L Stainless steel. The housing is also available in non-approved versions ensuring an outstanding protection to the sensor when used in rugged applications with high humidity and aggressive gases. The housings are sold in the US by Summit USA, LLC in Lake Charles, LA and by MTS Temposonics in Cary, NC and their distributors. The UL / cUL approved versions are assembled and tested in USA by Oilqiup, Inc.